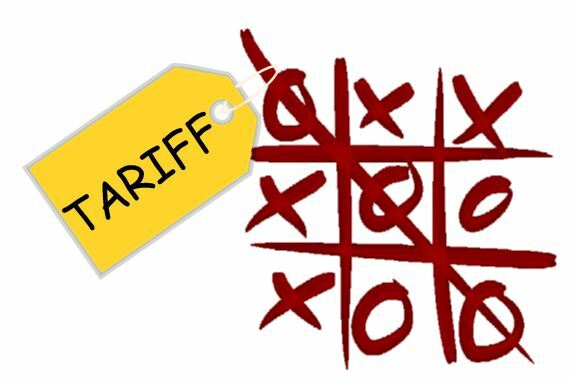 Download Tic-Tac-Toe Tariff Teacher Guide, Handouts and Visuals doc file (or pdf). Free Trade… Fair Trade… Who pays the tariff? In this simulation students are citizens in Country X and Country O. They are given a random “basket” of Dum Dum Pops and they trade with other students to get a more valuable “basket” by the end of the game. But, in order to trade with people from country X, citizens of Country O must pay the Tic-Tac-Toe Tariff which requires the playing of a game of tic-tac-toe and a visit to the customs officer for approval. Through the course of the simulation students experience gains from trade, and explore the impact of tariffs. Voluntary exchange occurs only when all participating parties expect to gain. This is true for trade among individuals or organizations within a nation, and among individuals or organizations in different nations. Exchange is trading goods and services with people for other goods and services or money. When people buy something, they value it more than it costs them; when people sell something, they value it less than the payment they receive. When imports are restricted by public policies, consumers pay higher prices and job opportunities and profits in exporting firms decrease. Visual 1 “Trading Results” prepared in slide or on white board. Before class, remove any “mystery flavor” Dum Dums from the bag. While it might seem fun to keep them in the mix, it adds an unnecessary distraction to the game as students will struggle over how to score “mystery” and the discussion could be side-railed into risk and reward. Keep it simple! You want the game focused on trade and the impact of the tariff on trade. Arrange a place in the front of the room where you can collect and stamp/initial the Tic-Tac-Tariff cards. While students are ranking the flavors, geographically divide the room in half (EX: left and right sides or front and back) and give half of the students in the room a post-it note to wear as a badge. The badge identifies them as citizens of “Country X.” Have the write a large X on their badge and place the badge on their shirt. The other half of the students are from “Country O.” Give each of them 1 Tic-Tac-Tariff card to begin with. Give every student a copy of Handout 2: “Trading Record.” Instruct them to fold the paper down the middle and only use the left side for round 1. Explain that you will be giving each of them a “basket” of 3 Dum Dum lollipops. They should write the flavors in their basket at the top of their “Trading Record” and then use their values from their “Flavor Ranking” to determine the value of the basket they were given. Pass out the Dum Dums. Display Visual 2 and explain their objective and the rules for round 1. Illustrate with the handouts an example of how they will calculate their basket, record a trade, and play tic-tac-toe during round 1. Display Visual 3. Have one student per table or row add up the values of all the baskets in their table/row and then you can quickly add all their subtotals to come up with a class-wide basket value before trade. Begin Round 1. Allow the round to run for 5-7 minutes or long enough for most students to have traded at least 2 or 3 times. Stop the round and give students time to calculate the value of their current basket of suckers. Expect that some students may end up with more or fewer than 3 suckers in their basket. That’s okay. For example, it may have been in their interest to trade two low value suckers for one higher value sucker. Use Visual 3 to record and display the results for the class. Have the same student per row/table get a basket total for their group then add all the group basket totals to come up with the class-wide basket value after trade. Subtract the original basket value from the new basket value to find the increase in the basket value. Explain that this represents the gains from trade in round 1. 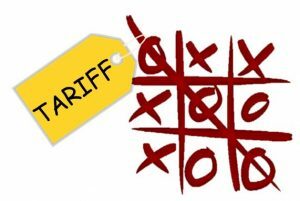 Use the Tic-Tac-Toe Tariff cards you collected as the customs agent to record how many international trades were conducted. Raise your hand if the value of your basket increased? Raise your hand if you participated in an international trade? How did it compare to trades you did within your own country? (International trades take more time/has a higher cost). Randomly distribute 3 more Dum Dums to each student. Have them calculate their basket values before trade. Collect and display the total value of baskets before trade on Visual 1. Display Visual 3: Rules for Round 2. Explain that in this round they are free to trade with anyone in any country. No Tic-Tac-Toe Tariff required. However, if they trade with someone from another country, they should record it by checking the “International Trade” box on their transaction record. How was round 2 different (number of trades, value of baskets, trades with people from other country)? There will likely be more trades, greater increases in basket value, and more international trades. How did the tariff in Round 1 impact trade, now that you’ve experienced a round without a tariff? The tariff reduces the number of trades. Does the tariff eliminate international trade? It reduces trade. But people will still trade if it’s worth it (benefits are greater than costs). Who benefits from a tariff? Government, people (producers) in the domestic country, as more people in their own country will trade with them given that international trades are more costly. Who is hurt by a tariff? People who would’ve traded had the tariff not made it too costly. Who paid the tariff? Citizens from Country O pay the tariff directly. Who bore the cost of the tariff? What are the costs of the tariff? Citizens from both countries bore the costs. Both had to spend time to play the game. Both gave up time they could be trading with other people. How does the tariff in this activity compare to tariffs in the real world? Even though foreign sellers pay the tariff directly, the buyer shares the burden of the tariff as some of the tariff is passed on to buyers in the form of a higher price. Foreign sellers bare some of the cost in the form of lost revenue as they will do fewer trades because of the higher cost. Suppose you hear in the news that the President has announced a number of new tariffs on Chinese goods coming into the U.S.
What would expect to happen to the amount of Chinese goods purchased by people in the U.S. as a result of the tariff? Who would see the tariff as “fair”? Who would see the tariff as “unfair”? Hot Topic Lesson: The US Airline Industry…Fight or Flight! ?